China is one of the countries which suffer the most from the invasion of alien species, with a record number of at least 283 species. The International Union for Conservation of Nature (IUCN) has identified the world's 100 worst invasive alien species. Of those, 50 can be found in China, according to Wang Jie, director of the Office of Bio-safety Management in the Department of Nature and Ecology Conservation. File photo shows the eichhornia crassipes (also called "water hyacinth") covering the water. Wang also notes that these invasive species have been causing a great economic loss of about 120 billion yuan (US$29.3 billion) every year. What's worse, 46.3 percent of them have invaded China's natural reserves. As alien species have continued to invade over the years, the number of local species has been greatly reduced and some have even become extinct. Alien species not only affect the ecosystem, but also impact China's agricultural and forestry production. According to a survey on invasive alien species by the former State Environmental Protection Administration in 2003, the direct economic loss caused by invasive species that year totaled 19.9 billion yuan (US$2.9 billion); the indirect economic loss on the ecosystem, species and genetic resources amounted to 100 billion yuan (US$14.6 billion). Combined together, the two occupied 1.36 percent of China's GDP that year. "The worst thing is an outbreak of the invasive species. Due to great difficulty in controlling their growth, they cause severe biological pollution and some irreversibly damage the ecosystem," Wang Jie says. Eichhornia crassipes (also called "water hyacinth"), originally from South America, was introduced to Taiwan from Japan for its beautiful flowers. During the 1950s, the plant was grown in bulk, as it was used to feed pigs. Today, the damaging effects of the plant are well-known. Infestations of this weed block waterways, which in turn limits boat traffic, irrigation, drainage and aquatic breeding. Covering the water, it damages aquatic ecosystems and threatens the local biological diversity. 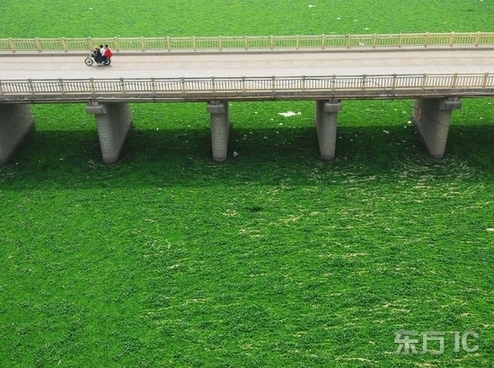 Water hyacinth has to be artificially cleared in Guangdong, Yunnan, Jiangsu, Zhejiang, Fujian and Shanghai every year. In Wenzhou City, Zhejiang, alone, the yearly expenditure to clear it is 10 million yuan (US$1.46 million). "China spends as much as 500 million yuan (US$73.2 million) to 1 billion yuan (US$146.4 million) clearing water hyacinth every year," says Yang Hongjun, director of the Yunnan Institute for Ecological Agriculture. "Its direct economic losses even amount to 10 billion yuan (US$1.5 billion)." "Objectively speaking, some species are intentionally introduced for good purpose; however, they are out of control due to poor management," says Zhang Runzhi, a researcher at the Institute of Zoology in the Chinese Academy of Sciences.